When the original Roots miniseries came on way back in 1977, I was only four but I can remember the event that surrounded the airing of the miniseries. My family would gather around the huge television in my grandmother’s living room, all routines for the evening taken care of earlier that day because in those days of not being able to DVR or hit up on Demand, you had to catch the original airing or miss out. We had to be quiet; everything stopped so that we could concentrate on what was happening on he screen. The day after the show aired, my mom and aunt would be talking about Kunte Kinte, Fiddler, Kizzy and Chicken George and other characters from the show. When I was older, I had to watch Roots for a class or would catch a few minutes of the show when it was aired on some cable channel but never watched it all the way through because…I don’t really know why. During part 2, Kizzy learned to read and watching her enjoy words, use her words to help, and then having that very love of reading used against her, made me want to read all of the things. Usually, when I think about the discussion surrounding slavery, I often experience feelings of shame, denial, anger, disrespected. Watching this remake makes me feel anything but. I feel proud, strong, and ready to read all of the things. 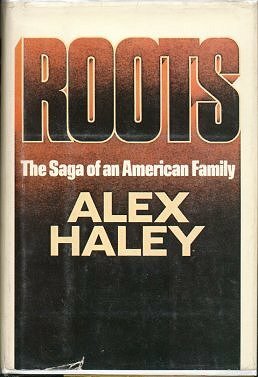 Here is a list of books to read inspired by Alex Haley’s Roots. Starred Review. It’s hard to believe that it has been 30 years since Alex Haley’s groundbreaking historical novel (based on his own family’s history) was first published and became a worldwide phenomenon. Millions have read the story of the young African boy named Kunte Kinte, who in the late 1700s was kidnapped from his homeland and brought to the United States as a slave. Haley follows Kunte Kinte’s family line over the next seven generations, creating a moving historical novel spanning 200 years. Avery Brooks proves to be the perfect choice to bring Haley’s devastatingly powerful piece of American literature to audio. Brooks’s rich, deep baritone brings a deliberate, dignified, at times almost reverential interpretation to his reading, but never so reserved as to forget that at its heart this is a story about people and family. His multiple characterizations manage, with a smooth and accomplished ease, to capture the true essence of each individual in the book. Michael Eric Dyson offers an informative introduction to Haley’s book, but it is Brooks’s performance that brings the author’s words and history to life. This book was inspired by the true story of Margaret Garner, a slave who would rather kill her child than subject her to the horrors of being a slave. In Morrison’s book, it is Sethe, who made the decision to kill her children before allowing them to return to slavery. As a free woman, Sethe is now haunted by the death of the child she killed. Dana is celebrating her birthday when she is suddenly whisked back in time to a southern plantation to save Rufus, the son of the plantation owner. Time and time again, Dana is called to the past to assist Rufus, at the risk of her own life. This is the true story of Solomon Northup, who was born and raised as a freeman in New York. He lived the American dream, with a house and a loving family – a wife and two kids. Then one day he was drugged, kidnapped, and sold into slavery in the deep south. These are the true accounts of his twelve hard years as a slave – many believe this memoir is even more graphic and disturbing than the film. His extraordinary journey proves the resiliency of hope and the human spirit despite the most grueling and formidable of circumstances. In this debut novel, Perkins-Valdez chronicles the lives of four slave women—Lizzie, Reenie, Sweet and Mawu—who are their masters’ mistresses. The women meet when their owners vacation at the same summer resort in Ohio. There, they see free blacks for the first time and hear rumors of abolition, sparking their own desires to be free. For everyone but Lizzie, that is, who believes she is really in love with her master, and he with her. An extended flashback in the middle of the novel delves into Lizzie’s life and vividly explores the complicated psychological dynamic between master and slave. Jumping back to the final summer in Ohio, the women all have a decision to make—will they run? Published in 1861, this was one of the first personal narratives by a slave and one of the few written by a woman. Jacobs (1813-97) was a slave in North Carolina and suffered terribly, along with her family, at the hands of a ruthless owner. She made several failed attempts to escape before successfully making her way North, though it took years of hiding and slow progress. Eventually, she was reunited with her children. For all biography and history collections. r’s note: Affiliate links are used in this post. If you click through and make a purchase, I will receive a small commission.